Saturday, I was cleaning out my refrigerator and found a carton of blueberries that were close to expiring. I hate throwing food away so I quickly went through the carton and saved all the blueberries that I could. I had about a cup by the time I was finished so I thought it would be the perfect amount to throw in to a batch of scones for Sunday morning. I quickly grabbed one of my go-to recipes for scones and started tinkering with the ingredients. I love the combination of lemon with blueberries (If you like that combination, check out this blueberry pound cake.) so I knew I wanted to add some lemon flavor in the scones. I decided on adding lemon zest as I would get all of the flavor, but wouldn’t have to worry about adding extra liquid. 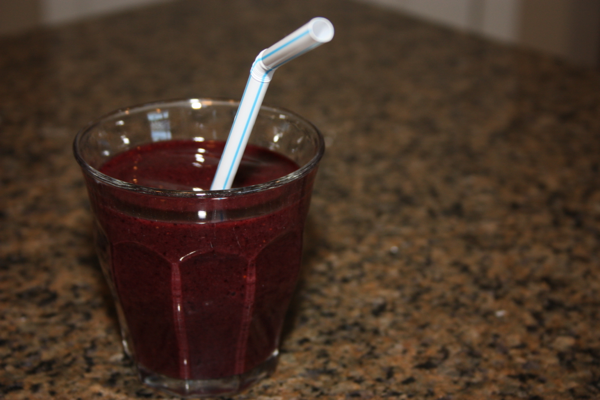 It turned out the lemon was a great compliment to the blueberries. 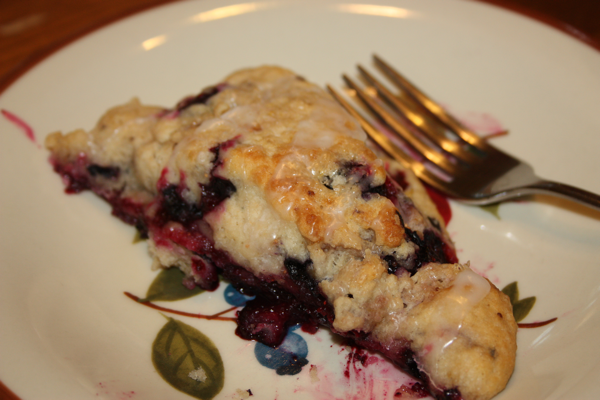 I carefully folded in the blueberries and pulled the batter together. I will make one change next time I make these scones. I will probably freeze my berries so I don’t have to worry about them popping and bleeding into the dough. I also decided to try my hand at freezing the scones before baking and found that it worked quite well. I put my scones together, cut them out into the triangle shapes, put them onto my baking sheet, covered them with plastic wrap and then stuck them into the freezer for the evening. Sunday morning I pulled the scones out brushed them with melted butter, sprinkled sugar on them and stuck them into the oven. I had to increase my cooking time by about 10 minutes but it was totally worth it. I definitely see me freezing more scones in my future. I think they will make a great treat for mornings when I need something easy but homemade. I also added a bit of icing on these scones that helped put them over the top in my own opinion. Using the lemon I had used earlier for the lemon zest, I juiced the lemon then mixed powder sugar to make a simple icing by whisking together. I then used the whisk to drizzle the icing over them. It was delicious. I loved the tartness that the lemon added. These scones will definitely be making it to my regular breakfast rotation. I see a whole variety of scone making in my future now that I know how well they bake up from the frozen state. I can’t wait to try adjusting the flavorings from my chocolate chip scone to make a mocha scone. Hmmmm, the possibilities are endless. Do you have any suggestions? Shape the dough into a 4-inch by 8-inch rectangle on your prepared baking sheet. Now cut the the rectangle in half. 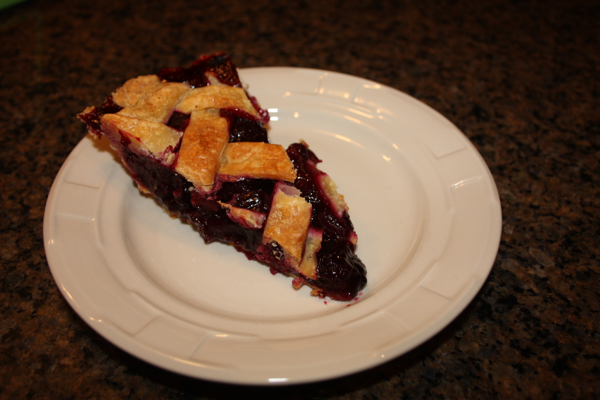 Cut each half into half and then each section into triangles by cutting them diagonally. Space out each triangle onto the baking sheet to insure even browning. You may freeze them at this point. I put mine in the freezer on the baking sheet until frozen and then place them in a resealable freezer bag for future baking. When ready to bake brush lightly with the butter and sprinkle with additional sugar. Bake for 15-20 minutes (about 30 if frozen)or until lightly golden brown. If desired combine the powdered sugar and lemon juice to make a glaze. Drizzle over hot scones. Enjoy! *If you prefer not to shape your scones you can also just scoop them out using a large scoop, dropping rounds of dough onto the prepared baking sheets. 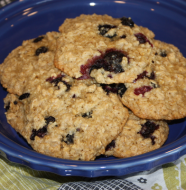 2 Comments on "Blueberry-Lemon Scones"
Question: do you have to use parchment paper? Could someone who doesn’t bake too much use alum. foil? I will have to give apples and walnuts a try. Perfect for the fall. I use a silpat most of the time. Go ahead and try the foil. I don’t see why it wouldn’t work.